Our standard two day trips are camping trips. However, a lodge stay option is available. Please call for details. **All Inclusive** Price includes tent, sleeping bag, and sleeping pad. Our standard two and three day trips are camping trips. However, a lodge stay option is available. Please call for details. Trips launch any day, seven days a week. Due to varied water level each year, season may vary. Class II: Current with small waves and few obstacles. Class III: Rapids with medium sized waves and few obstacles. 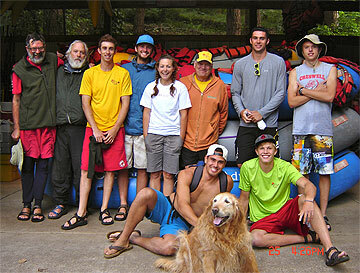 Trips are fun and thrilling, ideal for first-time and experienced rafters. Class IV: Rapids with medium to large sized waves and hydraulics and increased obstacles to avoid. Class V: Rapids with large waves and boat stopping hydraulics. These rapids require several maneuvers to safely navigate. Class V is very difficult and recommended for experienced rafters only. Class VI: Virtually unrunnable. For skilled experts only! !